The Left had better sober up and join an intelligible good faith debate about US immigration policy and the enforcement of existing laws or this will lead to exactly what Brent Tarrant laid out and what Mr. Trump maladroitly hinted at. Instead, of course, we will more likely commence another bootless campaign over guns. Here are some plain facts about that. There are already enough firearms of every sort loose in this land to commence hot civil warfare and they will not be surrendered by their owners. The horses are out of the barn on that one, even if sales of military-style weapons are outlawed. Any effort to confiscate them from people already possessing them will only provoke more overt antagonism between the two poles of American politics — and would probably lead to exactly the sort of violence that sober observers discern on the horizon. Our battered American common culture and its expression in political consensus ought to start with the foundation of the social contract: the agreement to not slaughter each other. That is, at least, the one principle that ought to stand on its own as self-evident, without any need for equivocation via “diversity” arguments. The Left is playing with fire on this with its dishonest, bad faith approach to debating the immigration question, and the gun debate will only provide a distraction from it. The “conservative” Right doesn’t dare call them on it, out of fear of losing Hispanic votes. The Hispanics who arrived legally, and the Hispanics whose families have been here for generations, are not all in favor of illegal immigration. Kid of foolhardy to think that all American Hispanics want to see an unfettered illegal inflow just because the illegals are fellow "Hispanics." Illegal immigration has been going down for last 11 years. A few years ago net illegal went -ve . So if it was not a problem during the earlier republican years, why is now. I will tell you. Because it riles the Republican base up. Illegal immigration has been going down for last 11 years. So tell me, what is the exact number of illegal immigrants that you're OK with paying for in the country? ...."There were 10.7 million unauthorized immigrants in the U.S. in 2016, representing 3.3% of the total U.S. population that year." What the acceptable number that taxpayers should cover? Is it 5 million, 10 million, 25 million, 50 million, 100 million? More? How many should the taxpayer pay for and provide schooling, medical care, welfare, EBT, etc.? You can thank Obama for that! Nothing like a good civil war to destroy an economy. Millions & millions aren't ready for empty supermarkets & no water at the municipal taps. All these dumbasses think they can fight a few hours a day,go home & have a big meal & watch FOX. No one will be immune from Americans killing Americans in the streets. In two years,how many illegals did Trump deport? How many illegals are working for Republicans? "The Left had better sober up and join an intelligible good faith debate about US immigration policy and the enforcement of existing laws or this will lead to exactly what Brent Tarrant laid out and what Mr. Trump maladroitly hinted at. Instead, of course, we will more likely commence another bootless campaign over guns. Here are some plain facts about that. There are already enough firearms of every sort loose in this land to commence hot civil warfare and they will not be surrendered by their owners. The horses are out of the barn on that one, even if sales of military-style weapons are outlawed. Any effort to confiscate them from people already possessing them will only provoke more overt antagonism between the two poles of American politics — and would probably lead to exactly the sort of violence that sober observers discern on the horizon." You'd be surprised. I grew up in San Antonio which was nearly 50:50 Hispanic/White back in the day and the TexMex folks didn't like illegal immigration either. Much different people than the illegal aliens running around in CA with Mexican flags protesting - but in theory those folks can't vote. Republican politicians are just pussies / out for themselves. And don't forget the US Chamber of Commerce! 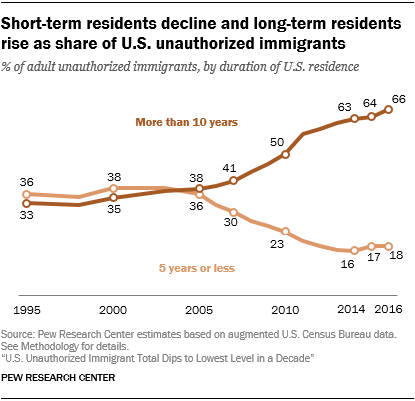 I love how Pew says "Unauthorized Immigrants" on their chart. Such pandering. Having grown up in New Mexico, I can corroborate this.